Here's an HOT deal to grab on Softsoap Body Wash at HEB as part of the new Colgate-Palmolive catalina promotion kicking off at HEB on Wednesday, March 14! First things first: if you're not familiar with how catalina deals work at HEB, be sure to go here for more information. And if you're not familiar with how piggybacking works, you'll need to go here for my how-to guide. 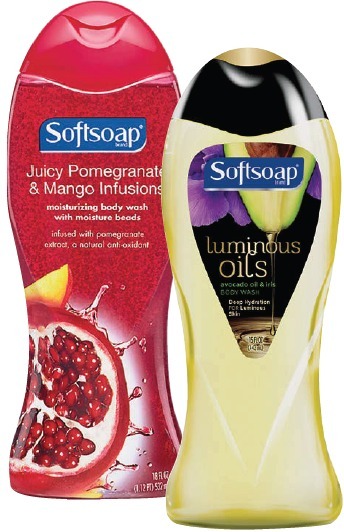 Softsoap Body Wash -- assorted 18 oz varieties priced at $2.97 each, with a Buy 3 Get 1 Free yellow coupon available in stores starting 3/14. Buy four bottles for a pre-coupon price of $11.88. Use the B3G1 Free yellow coupon to take $2.97 off your price. That drops your price down to $8.91 for all four bottles. Next, piggyback three of this 75 cents off coupon (multiple devices required.) Remember, you aren't stacking coupons in this scenario -- you are buying four items, and using four coupons. Pay $6.66 out of pocket for all four bottles, then still receive your $3 catalina coupon at the end of the transaction to use later in March. That's a final price of $3.66 for everything, or just 92 cents each! FAIR WARNING: Catalina promotions at HEB are getting more and more popular with couponers, but cashiers (and stores!) aren't always up to speed when a new promotion starts. So if you want to pick this up, be prepared to follow up with the manager on duty if your catalina doesn't print and/or your cashier isn't familiar with the promotion. It's much easier to get this addressed at the register or immediately after you shop, although you can go back in the next day to talk to a manager if it's necessary. You can also request your reprinted catalina online, although obviously you will have to wait longer to get the new catalina mailed to you. Also, note that you can only request ONE reprinted catalina per promotion -- another reason to get everything resolved right away at the store! See more HEB catalina deals here.